Most people's diets are woefully inadequate for providing proper nutrition. Even good diets fail to deliver sufficient levels of nutrients. The Vitamin Cure book series highlights the safe and clinically effective use of vitamin supplements for a variety of illnesses. Most people’s diets are woefully inadequate for providing proper nutrition. Even good diets fail to deliver sufficient levels of nutrients. The Vitamin Cure book series highlights the safe and clinically effective use of vitamin supplements for a variety of illnesses. Research continues to prove the immense value of vitamins for maintaining health and fighting disease. The Vitamin Cure books, written by authors who are recognized experts in their field, deliver authoritative, up-to-date, and practical information on taking vitamins for particular health problems. A healthy diet can have a profound impact on a child’s development and growth, helping him or her stay well and avoid illness. This book is a practical guide to using therapeutic nutrition for a number of common childhood illnesses that can be prevented and effectively treated with vitamins and other nutrients. 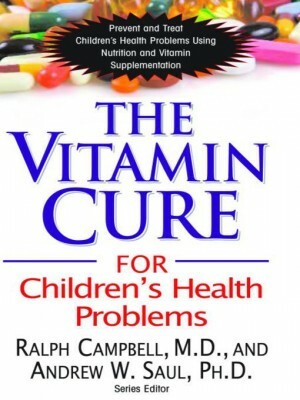 The Vitamin Cure for Children’s Health Problems introduces readers to the concept of orthomolecular medicine to take control of their family’s health. It covers the pros and cons of antibiotics and vaccinations and looks at natural ways to boost immune function. Information on healthy eating for children is thoroughly covered, as are ways to protect children from a toxic environment. The book also tackles three of the most pressing health issues for children: obesity and diabetes, allergies and asthma, and attention-deficit hyperactivity disorder (ADHD). Finally, it provides guidance on using therapeutic doses of vitamin C and other nutrients. The good news is that therapeutic nutrition is cheap, simple, effective, and safe.